Pop by to say hello, check out the samples, and get a signed print copy of Handmade in the UK (don’t worry, you’ll get the ebook too!). And since it is ALSO Kathy’s Knits first birthday bash, there’s going to be a knitting-themed cake… What could be better?! 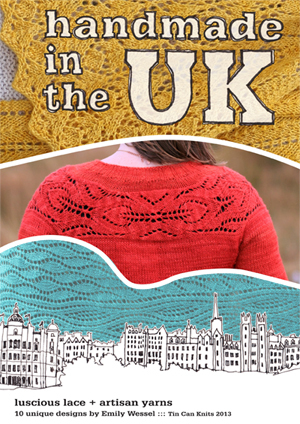 Join me in a toast to my new home here in Scotland, the latest designs, and future collections to be knit here in the chilly north, where a sweater is called a ‘jumper’! I am bringing the luscious samples from Handmade in the UK for you to pet, try on, and coo over – I think they are even yummier in person! And I will have a few pieces from our other collections too: Pacific Knits and 9 Months of Knitting – both of which are also for sale. 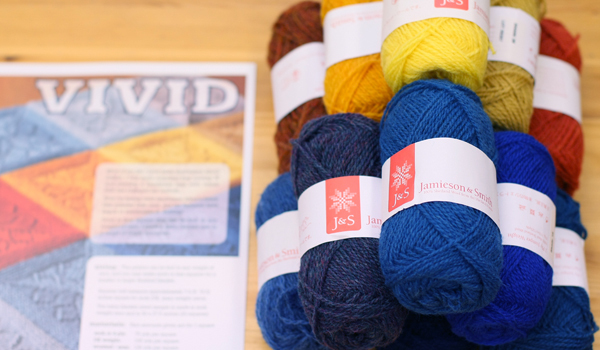 The Vivid blanket was designed in Jamieson & Smith’s 4-ply, and Kathy’s Knits has lots of stock and really wide range of colours to choose from! The most fun part of the project may be choosing your own rainbow! 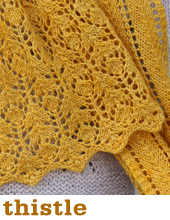 This bold and big lace pattern would look fabulous in one of the beautiful and unique hand-dyed yarns from Eden Cottage Yarns. 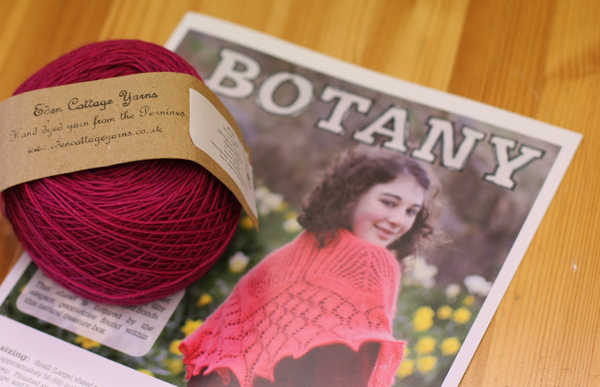 I love this vibrant berry-coloured skein! 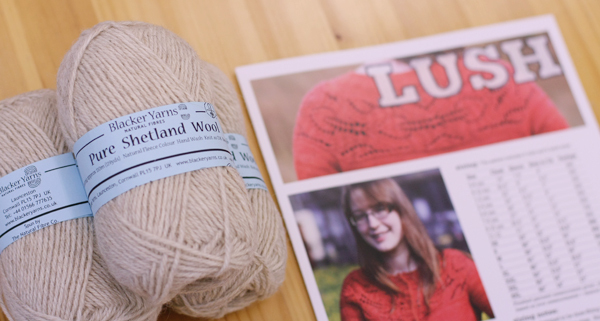 This cardigan looks great in bright colours, but the lace pattern really shines in classic neutrals – this pure undyed Shetland DK would be perfect! 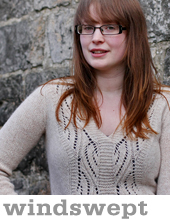 Check out the other versions of Lush that folks have knit in whites and neutrals here – I love this one, and this one too! 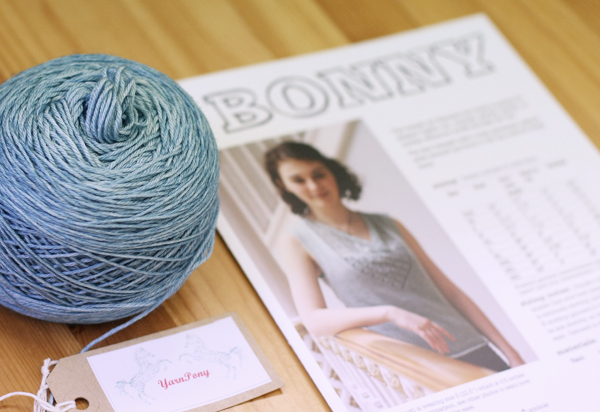 And one of my personal favourites, the Bonny sleeveless top can be knit in lace weight, or it would also be very lovely in a 4-ply merino-silk blend like this exquisitely subtle blue by Edinburgh dyer Yarn Pony. Can’t make it to Kathy’s Knits? The trunk show will be in the shop for a few weeks following the party, so stop by at your convenience. 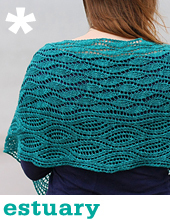 And of course you can always buy the ebook or any of the single patterns digitally from our website. The weather forecast is 25C, so hope we spill outside, otherwise the shop will be like an oven!!! Can’t wait to see estuary… it’s just so descriptive! ooohhh! Hot hot hot! I’m very excited!